Although seeming like a chick flick (which I detest) last night I went and had a gorgeous Japanese meal then followed it by this beautifully great movie. 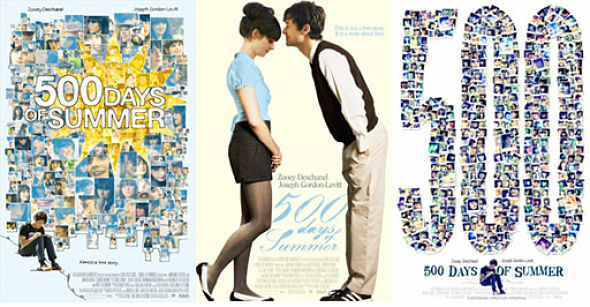 Its a story of "Boy meets girl. Boy falls in love. Girl doesn't"
A relationship; the beginning the ups and downs and The End. It draws reference to feelings and decisions we have all felt or had to make sometime. However it differs from the usual hollywood love story, its real. For me it was a rather uncomfortable viewing as it seemed to to be almost exactly the same as a long term relationship I had been in. Like even things they said! IT WAS WEIRD! In my situation I shared the same views as Tom Hanson-believing in love, and the person I loved carried the same views as Summer Finn, being a free spirit and not really believing in love. I don't want to spoilt it any more so check the trailer below and go watch it at the cinema! "Have you ever even had a boyfriend"
"What happened to them, why didn't they work out?"